Moyra Stewart was born in Edinburgh , graduated from Edinburgh College of Art and subsequently worked in London before emigrating to Canada where she lived on the west coast for 20 years. On returning to Scotland she helped found the Fife Art Co-op which was instrumental in formation of The Steeple arts facility in Newburgh. 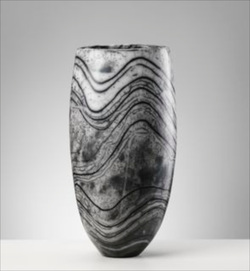 She has been making and exhibiting large ceramic vessels in Naked Raku, since returning to production in 2008. Moyra says: "Previously a decided "NO', I am now undecided and still thinking about it...."